Being caged by your emotions? I regularly work with people who have a lot of stress going on in their lives and then do have some sort of health problem manifest as a result of it. I always look into what is going on in a person’s life if something has changed with their health recently. Two examples that I have seen lately, a bladder infection and an upper respiratory infection. Both of these patients had their infections occur after having a stressful situation happen in their lives. The first thing I did was to ask what was presently going on with them recently that was stressful. Sometimes just a slight acknowledgment is enough, or sometimes I really have to let the patient vent, especially if it is something that they couldn’t talk to others about. When we hold in emotions, we dishonor our body. We need to talk about our feelings and we also need to act upon our will. If we don’t do this we are setting ourselves up for blockage in our body’s natural flow of systems. You are setting up a dam in your flow of health by repressing emotions or you will. My job as the doctor is to then find out which organs and/or acupuncture meridians the emotions are binding up. When we block out acupuncture meridians, we slowly starve the related organs of the life force that they need to for healthy balance. Many times, just having the energy flow restored in the body, and having the person work out the emotions that they are holding in will cause an infection to be resolved. Once the body reaches its balance again, it regains health. In my personal view, infection sets in because a tissue in the body has become imbalanced. When the tissue becomes unhealthy, disease sets in. The good and bad microbes in our body become imbalanced and infection occurs. When health is restored to to an organ or tissue, the microbes go back into balance and the good microbes overtake the bad ones. Bringing balance to the body is done by making sure the joints are in place in the spine arms and legs, that the emotions are in balance and flowing so they don’t get stuck, and that the biochemical pathways are functioning properly in the body. When this in done with muscle testing to see what is causing the imbalances in the first pace, the patients can feel that they are getting better right away. Don’t hold in your emotions. Talk to loved ones about what you are going through until you feel relief. Don’t deny your will. If there is something that you have to tell someone or an action you need to take, don’t sit on it. Do it. Figure out on a daily basis what you need in life to make yourself happy. Even if it’s just the little things. Meditation of only 10 minutes a day can be a big help to relieve stress. This can be as easy as focusing on you breath as you let you body relax more and more with every breath. Meditation doesn’t have to be complex. As for the two patients I talked about above. They both felt better immediately after their treatment. Within 3 days they were feeling 100% better. They did a great job of realizing what was causing their health challenge and worked to resolve it. 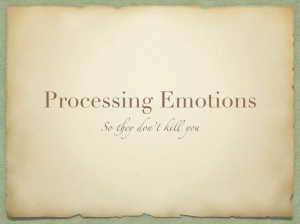 To learn how to work on your own emotions, click here for the online course Processing Emotions. This entry was posted in Every Day Muscle Testing, General thoughts, Patient education and tagged alternative, Applied, bladder, body, emotions, health, infection, kinesiology, Mind, muscle, natural, respiratory, testing, upper. Bookmark the permalink. Enter your name and email below to be on our mailing list. What supplements do you need?